(Bloomberg) -- After a bout of European-inspired steepening, a currency rout in Brazil is pushing Treasuries traders to renew bets that the U.S. yield curve’s march toward inversion will continue. The spread between 2- and 10-year yields shrank about 2 basis points Thursday to 43 basis points as traders reacted to emerging-markets turmoil and started to looked ahead to next week’s Federal Reserve decision. 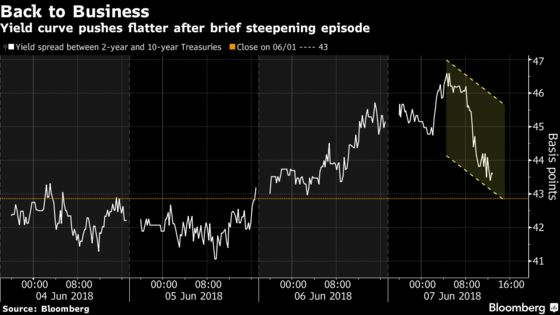 The curve had steepened to around 47 basis points earlier in the New York session as Treasuries took a cue from European debt, which has been slumping on signals from European Central Bank officials that they’re about to debate when to stop buying bonds. BMO Capital Markets and JPMorgan Chase & Co. expect the Fed to drive the curve even flatter next week, with the central bank expected to raise rates and reiterate plans to keep hiking in 2018. Any steepening episodes provide an opportunity for those looking to get into the trade, strategists at the banks say. The Thursday rally in Treasuries came as bullish foundations in other markets swayed a bit. Technology stocks tracked by the Nasdaq 100 Index halted a four-day rally. Volatility in the gauge jumped the most in two weeks. Markets have been focused on the shape of the curve in recent months, given that an inversion has historically been a reliable recession indicator. The spread between 2- and 10-year notes shrunk to as little as 40 basis points last week, the flattest level since 2007. That dynamic will persist, according to JPMorgan, which expects the Fed to pursue two more hikes this year after next week, and four in 2019, prompting short-end yields to rise more rapidly than those on longer-dated debt. Investors should jump on any climb back toward the range of 47-49 basis points, Barry said. BMO expects the curve to end the year inverted, with 10-year yields below 2-year yields. In the meantime, the Fed meeting ahead and the potential for more political turmoil out of Europe should push it below 40 basis points, said rates strategist Aaron Kohli. “A Fed that says ‘Guys, we’re still on track,’ plus some minor news out of Europe is probably all it’s going to take to break that cycle low,” he said.